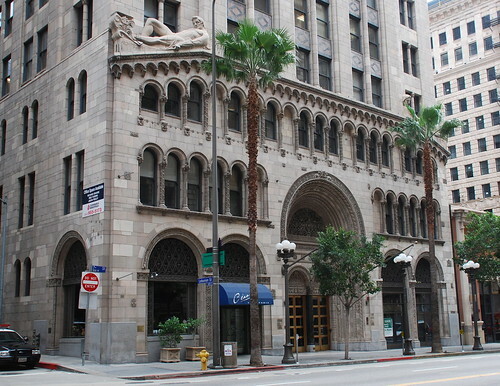 You know, if you would have asked me a few weeks ago how Major Henry Hancock, the patriarch of the family whose land holdings once encompassed Hancock Park, most of the Wilshire district, and part of Hollywood, made all his dough, I would’ve answered, oil, of course. Well, not only did he not make any money from oil, but he died nearly a decade before Doheny and Canfield made L.A.’s first strike at Glendale Boulevard and 2nd Street. Turns out, though, that land the major owned was oozing with the stuff. With his brother, Hancock came to Southern California in the early 1850s as a lawyer and land surveyor. The pair wound up buying the 4,400-acre Rancho La Brea from the Rocha family. In 1863, Henry married Ida Haraszthy, daughter of Hungarian Agoston Haraszthy, the “Father of Modern Viticulture in California”. Major Hancock died at the age of sixty in 1883. 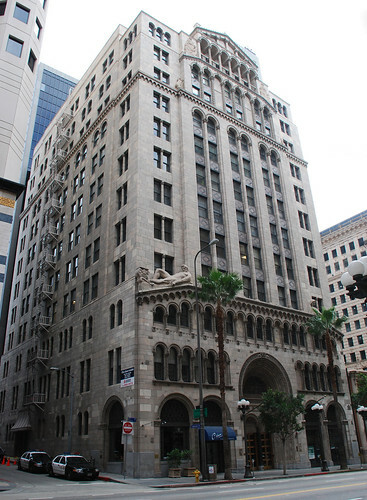 By 1908, Ida bought a lot at the northeast corner of Wilshire and Vermont Boulevards in a subdivision called Shatto Place. 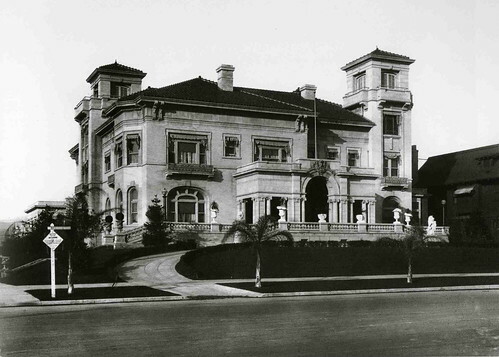 She had earlier hired John C. W. Austin (he of City Hall, Griffith Observatory, and Shrine Auditorium fame) to create for her the Italian Renaissance Revival mansion which, for this daughter of a phony Hungarian count (he was Hungarian, just not a count), became known as “Villa Madama”. 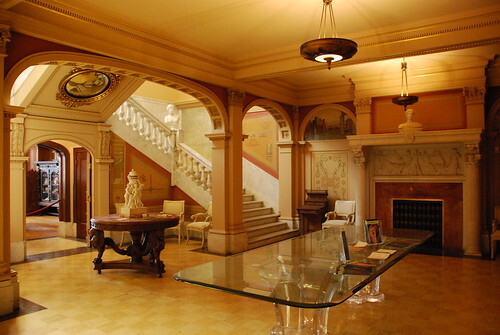 Austin based the 23-room mansion on Florence’s Villa Medici. In 1913, upon his mother’s death, Captain George Allan, with his first wife, Genevieve, moved into the mansion, living there until 1938. 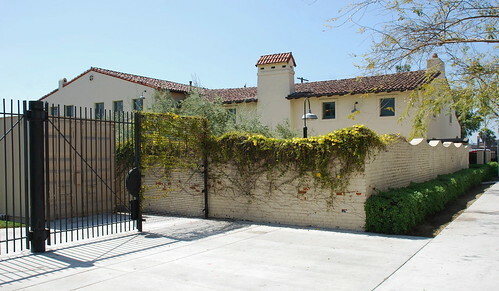 It was at that time when, while the Captain was funding a building at USC, it was decided Villa Madama would be razed. 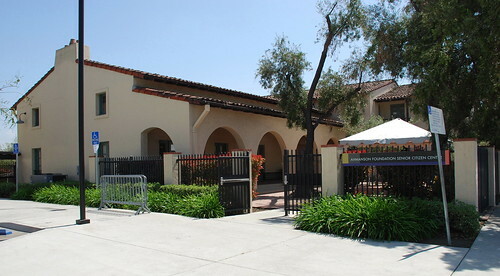 Before demolition, though, four rooms were dismantled and relocated to the new facility, the Allan Hancock Foundation Building, dedicated on campus in 1941. 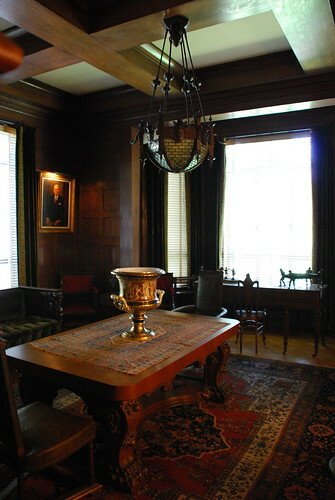 The four rooms include the Reception Hall, the Dining Room, the Music Salon, and the Library. 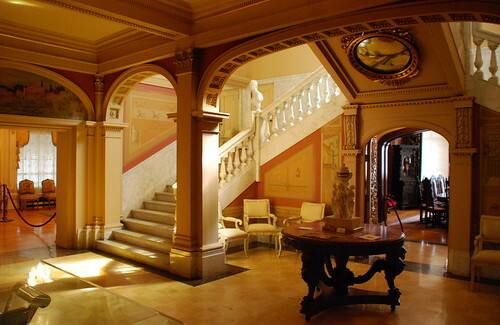 The Roman-styled Reception Room, with its marble stairways, features Othmar Brioschi murals of Pompeii and Herculaneum and decorations by Madame Adeline Katona. 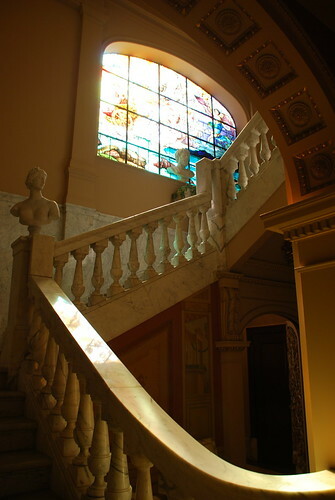 If the photo below didn’t reek so bad, you’d be able to see better the German artist Francis Xavier Zettler’s stained glass work, “Aurora Dispelling the Night”, located above the staircase landing. 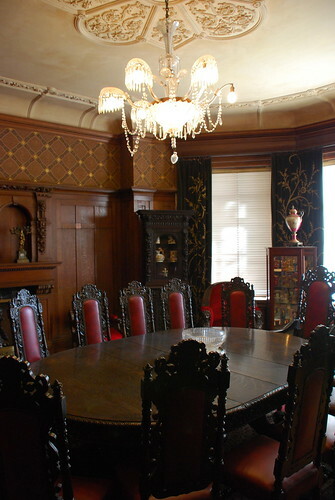 The Dining Room, early Georgian, contains an Austrian chandelier, Burmese sandalwood screens, French and Italian credenzas, Swiss cabinets, Chinese brasses, and French gargoyles. A veritable United Nations of dining rooms. 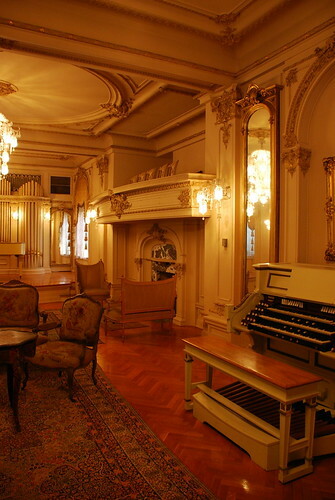 The most elaborate room there, the Music Salon, above, is done up in the style of Louis XV French Rococo. On top of the original oak floor rests a Persian rug, and on top of this is furniture once belonging to Mexico’s Emperor Maximilian and Empress Carlota. There’s a Steinway piano and Wurlitzer organ. Above the latter is an A. Madras painting of the patron saint of music, Saint Cecelia. 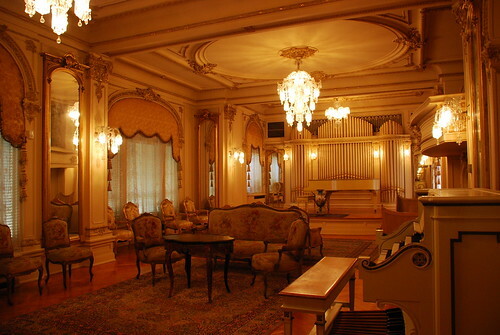 When not joining the Hancock Ensemble on his cello, the Captain with his family would sit in the room’s little balcony to soak in whatever performance was going on. 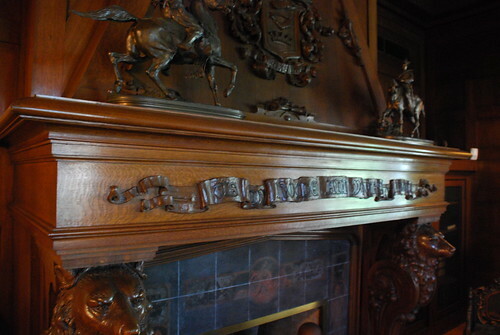 Next to the Music Salon is the Edwardian Library with its portraits of G. Allan and his mom. 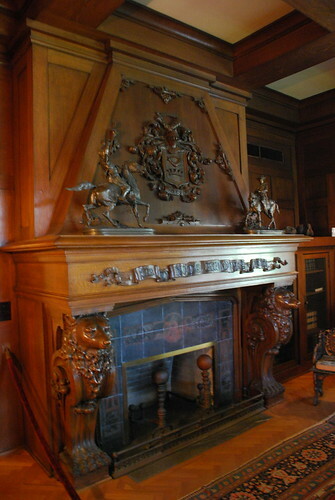 It’s hard to tell in the blurry pictures, but below the mantelpiece is inscribed “Tis my home and yours, my friend.” Not true, of course, but I guess that sort of sentiment held a lot of water a century ago. A big Big Orange Landmarks thanks to Suzanne and Melinda at USC for arranging and giving the tour of the Museum. If you’re interested in checking out the place, you can find their contact information on this website. 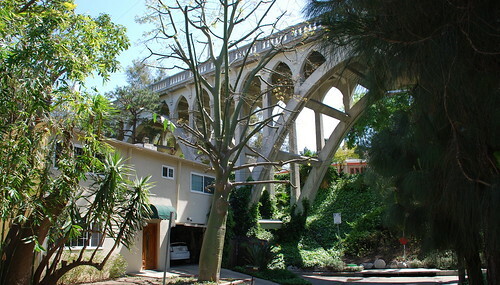 If there’s a better way to get a glimpse of how folks like the Hancocks lived in Los Angeles way back when, I don’t know what it is. Oh. 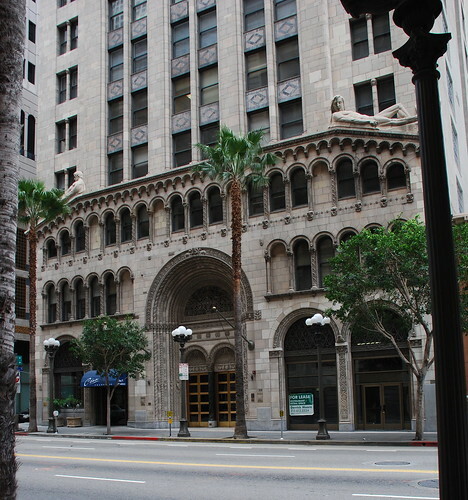 Here's the site of the Hancock Mansion at Vermont and Wilshire today. The biggest change, of course, is that graffiti on the curb. 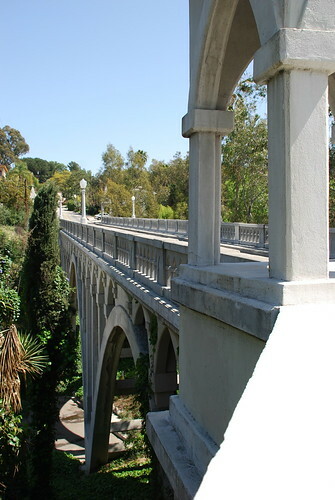 Known as Agricultural Park since the 1870s, the 160-acre tract was renamed Exposition Park in 1910. In just three short years, the park was already home to a state armory, an exposition center, sunken gardens, a central fountain, and what would become the Natural History Museum. 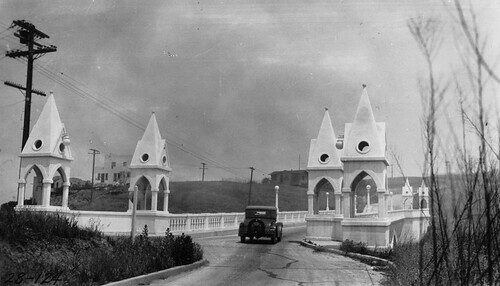 The Exposition Club House was built sometime in the 1920s. Maybe the mid- to late-twenties, but possibly as early as 1922. A Los Angeles Times article from June 20, 1924 announced the city’s Playground Commission’s plans to build a pair of clubhouses, one each in Echo and Exposition Parks. 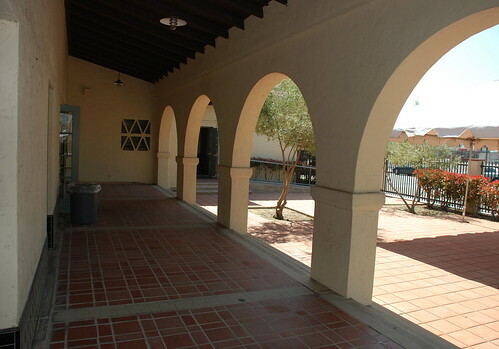 The cost of the Exposition Park structure was estimated at $75,000, to be paid for with a commission bond issue. 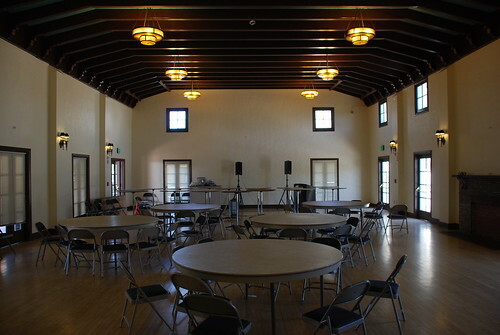 “The Exposition Park clubhouse is part of a plan… which will eventually give to the area baseball diamonds, tennis and horseshoe pitching courts.” I’d bet it’s the same clubhouse, but I wouldn’t bet a lot. For perspective, the neighboring Coliseum opened in June, 1923. 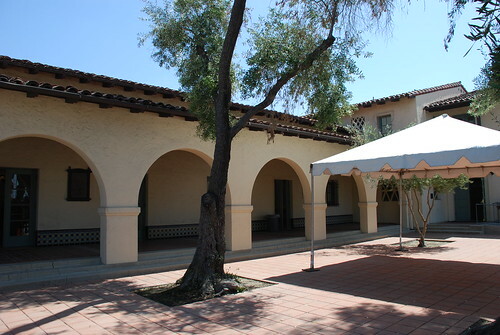 What’s unknown is the architect behind the Spanish-Colonial Revival building. I’m not sure that’s too tragic. 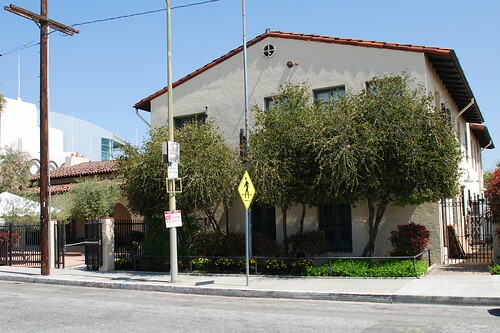 I’m glad the building’s still around and being made of good use (it’s now the Ahmanson Senior Citizens Center and is part of the city’s Recreation and Parks Department), but it’s sort of unremarkable, I think. Oh. I did get in two or three interior shots before I was busted. For what it’s worth, both the guard and his boss to whom he brought me were both good guys. Or maybe they were just suckers for my crocodile tears. What a piece of work is a span. Funny. 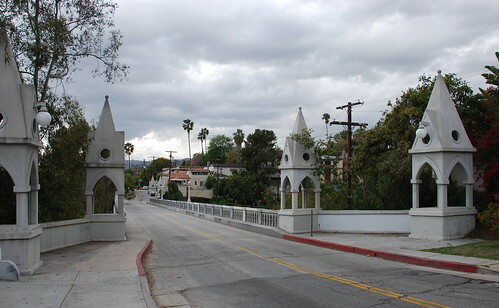 Just this past weekend the Los Angeles Times had a brief piece on Franklin Hills in which they mentioned Shakespeare Bridge. The upshot was there’s yet to be found any evidence backing up rumors a scene for The Wizard of Oz was shot on it. 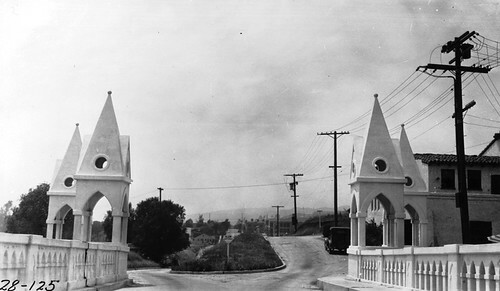 The black and white pictures below are from USC's Digital Archive. They were taken in 1928, and, looking at them today, you sort of wonder how badly folks then needed the bridge, with things looking so barren and all. Nearby John Marshall High School was still three years away. Clearly this bridge means a lot to the local community. 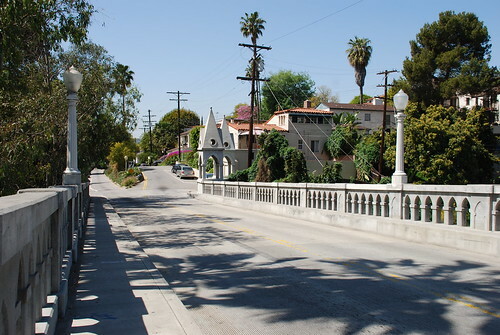 After taking a very palpable hit in the 1994 Northridge earthquake, Shakespeare Bridge needed some serious repair work. 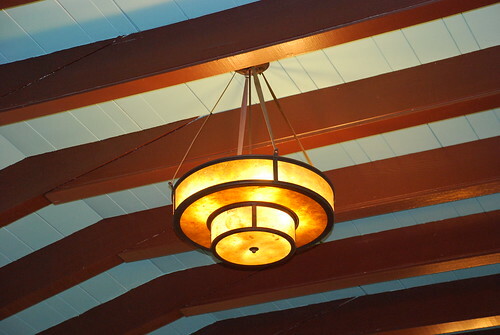 Representing the gateway to Franklin Hills, the span was given a $1.5 million seismic retrofit by TM Engineering. Retrofit work included complete removal and reconstruction of the bridge’s deck, sidewalk, and the railing on both sides of the bridge. 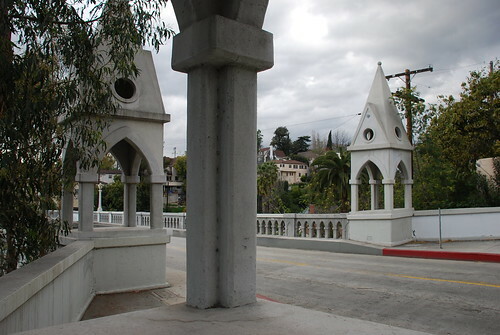 The abutment walls at each end of the bridge were removed and replaced with stronger reinforced concrete to transfer seismic forces from the bridge deck to the ground. 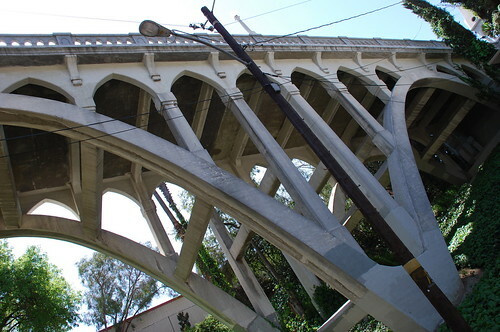 The arched ribs, spandrel columns and spandrel wall under the bridge deck were also removed and reconstructed with reinforced concrete to strengthen the historic arches and to allow forces to be safely transferred through them to the ground. 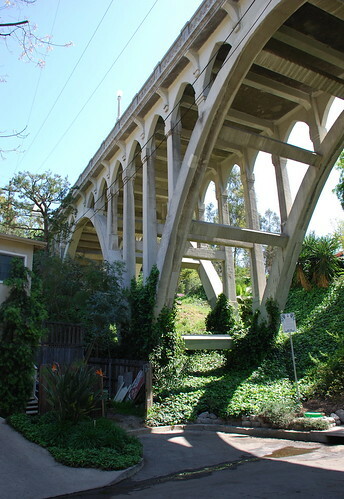 The key element of the new seismic design was the removal and reconstruction of the bridge deck. Whew! In other words, it sounds like the whole bridge had to rebuilt from top to bottom. I don’t remember being inconvenienced traffic-wise during this time, but you can bet area residents experienced a huge pain for the year or so. 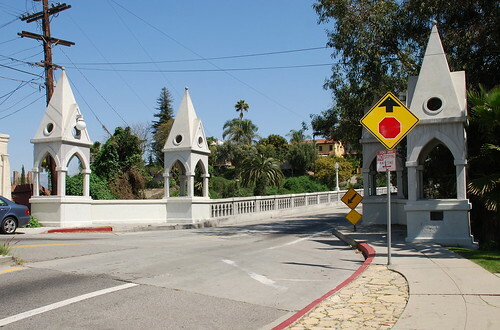 Shakespeare Bridge was rededicated on May 9, 1998. Oh. And the reason it’s called Shakespeare Bridge? You got me. But, then again, what’s in a name? That which we call a road by any other name would still be a street. 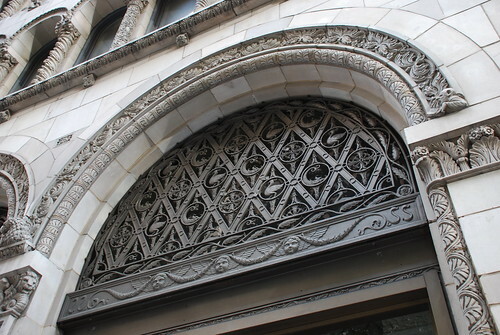 The lobby of the Fine Arts Building is amazing in its ornamentation. However, I was stopped from taking any pictures because, naturally, indoor photography isn’t allowed. When I asked him why that is, a security guard came up with, “Building policy.” Well, that answers that. I knew there had to be a good reason. 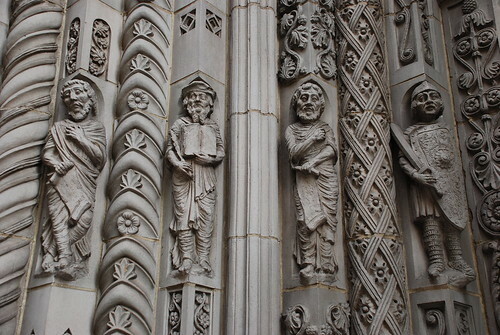 Built for artists and craftsmen to develop their works, the twelve-story monument was designed by the firm of Albert Walker and Percy Eisen in the Romanesque Style. 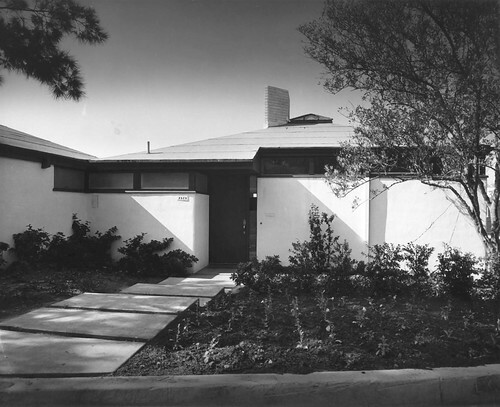 It’s been known as a few titles in its eighty-year history – the Fine Arts, Signal Oil, and Havenstrite Buildings, and then, beginning in 1969, the Global Marine House. 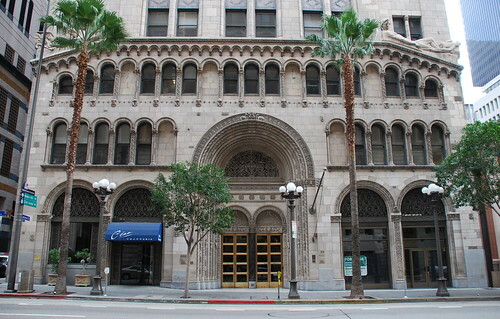 In the early 1980s, at the cost of $17 million, Ratkovich, Bowers Inc. purchased and, with the help of Brenda Levin Associates and Gensler & Associates, restored the landmark just like they had done for the Oviatt Building downtown and were doing for the Pellissier Building. 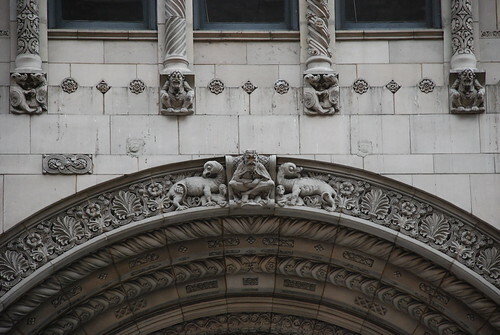 Also, the owners switched the name back to the Fine Arts Building upon its reopening in 1983. 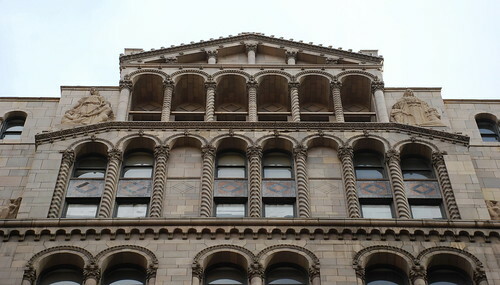 The terra cotta was provided by, as for the Pellissier and Garfield landmarks, the Gladding, McBean & Company. The stunning 3,000 square-foot lobby features murals by A.B. Heinsbergen and is encircled by seventeen display cases, originally for showing tenants’ artwork but holding photos of old L.A. when I was there (I mean when I was there at the Fine Arts Building, not when I was there in old L.A.). 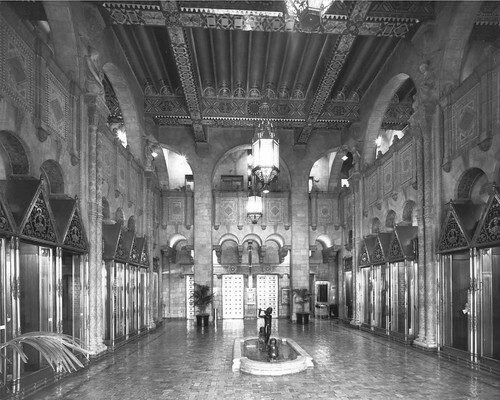 Bordering on over-the-top in decorative artwork from floor to ceiling, the lobby is slathered in tilework by Ernest Batchelder. 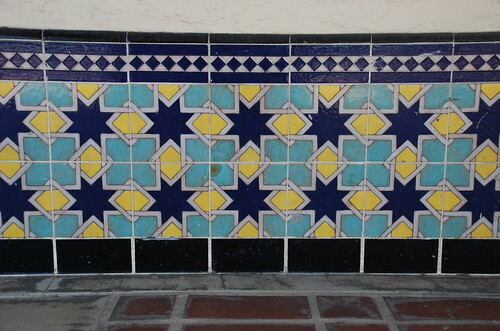 Builders Edwards and Wildey hired one of Southern California’s best-known sculptors, Burt William Johnson, to decorate their building. 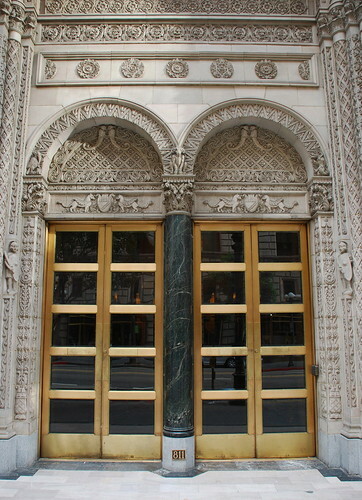 Johnson went on to create two hefty statues, a pair of large outdoor panels, and a bunch of smaller pieces for the building before dying of a heart attack. 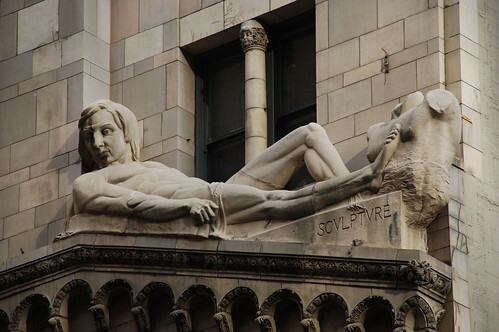 His two sculpts, “Architectvre” and “ Scvlptvre”, can be seen lounging outside the ninth floor. Here's "Scvlptvre", and try not to get a crick in your neck looking. Seriously. 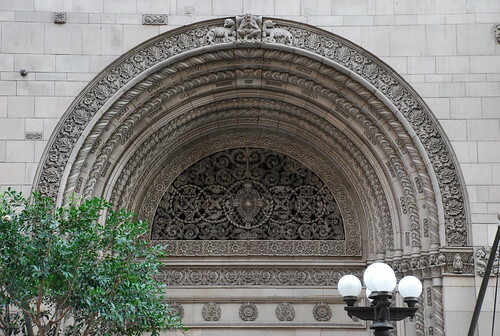 If you’ve never poked your head inside the Fine Arts Building, you owe it to yourself to do so. But, please, for the sake of humanity, don’t take any pictures. Oh. And, sadly, the Fine Arts Building is no longer home to either the Cap 'N Quill or the Pig ‘N Whistle restaurants. 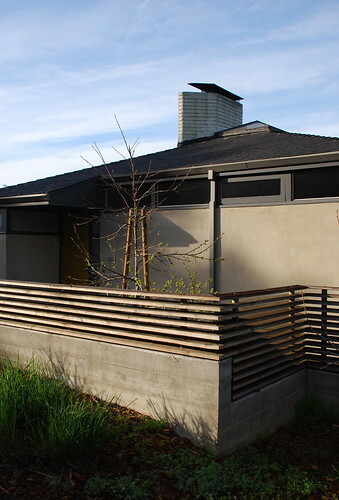 Capping off this trifecta of modernist homes (with the previous Schindler and Neutra houses) is this 1939 Silverlake house designed by Gregory Ain in collaboration with Visscher Boyd. 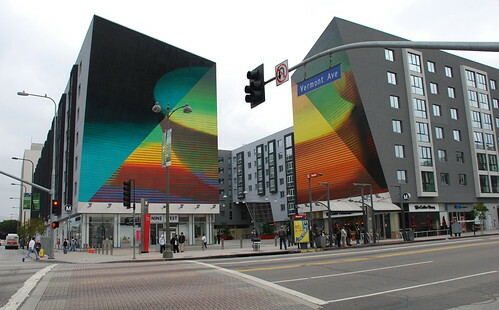 What gives this post almost perfect timing is Ain – “the first architect raised and educated in Los Angeles to work in the International Style” – would’ve celebrated his 100th birthday next Friday, March 28. 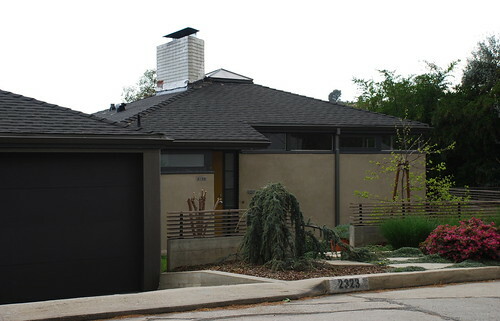 Gregory Ain was born in Pittsburgh, but moved with his family to Los Angeles in 1911 (in the 1960s he’d head back to PA to serve as the dean of Penn State’s School of Architecture). 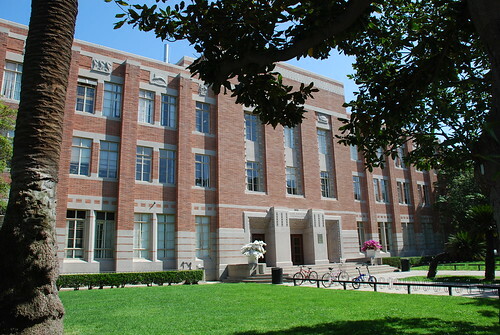 He studied math and physics for a couple of years at UCLA then switched to architecture at USC. 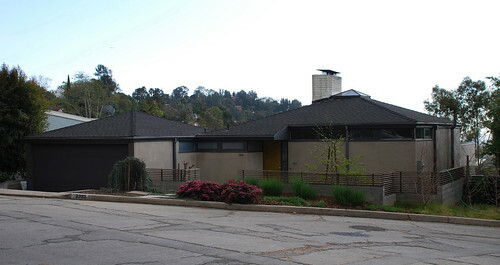 After graduating in 1927, he moonlighted for Richard Neutra and even worked for Rudolf Schindler for a few weeks in 1932. 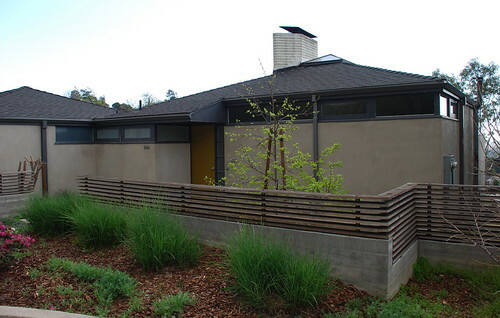 According to The Architecture of Gregory Ain, his “first completed commission was for furniture, remodeling and an addition to Neutra’s 1934 Galka Scheyer house” in Hollywood. 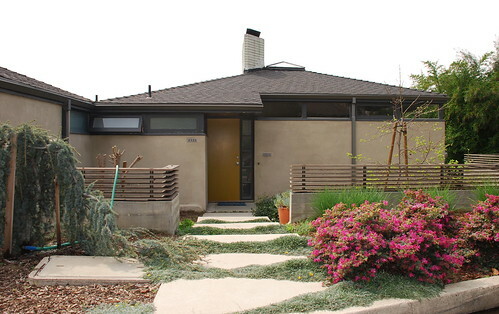 Working much on low and mid-cost housing, Ain did nearly all his life’s designing for Southern California. 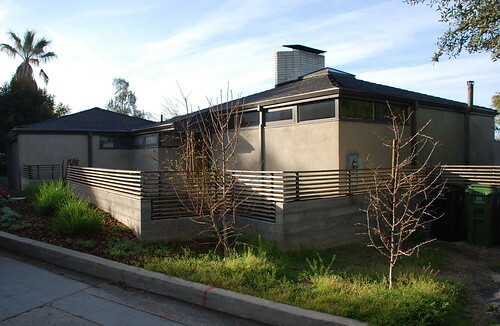 With so many of his works in L.A., I’m sort of surprised the Tierman House – built for Mr and Mrs Samuel Tierman – was the first Ain building to be recognized by the city’s Cultural Heritage Commission. 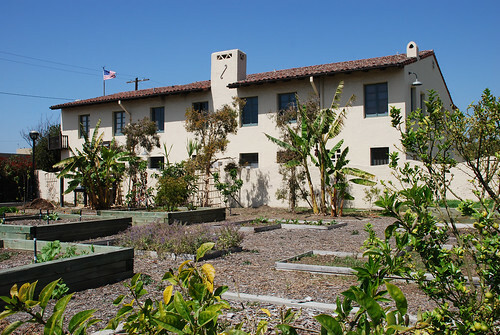 What’s even more surprising is that what’s probably his most famous building, Dunsmuir Flats in Mid-Wilshire, has never been designated a landmark. I’m thinking there’s an obvious reason why it hasn’t made the cut, and that someone will point it out to me. 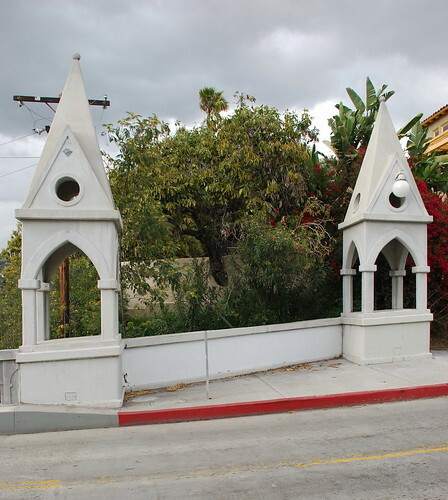 Ain had the rare kick of living to see a pair of his works declared Los Angeles Landmarks; he had just turned 66 when his Tierman House was designated an HCM in 1974 (his Edwards House on Holly Oak Drive got its nod at No. 260 nine years later). He died in 1988.